Bite force is an easily measurable, repeatable, and ecologically relevant measure of performance of the jaw system in vertebrates (Anderson et al., 2008). Bite forces are correlated to diet (Herrel et al. 2001; Verwaijen et al., 2002; Aguirre et al., 2003), cranial design (Herrel et al., 2001, 2004, 2005) and fighting capacity (Lailvaux et al., 2004; Huyghe et al., 2005; Vanhooydonck et al., 2005a,b). Bite force capacity has been tested in a wide array of vertebrates (mammals, birds, lizards, turtles, crocodiles) and provide a reliable measure of bite performance. Below I give some more details on the current set-up we use to measure bite forces which was designed by Jan Scholliers. 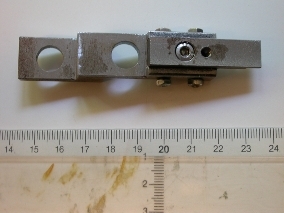 The set-up illustrated here (used for medium sized animals) consists of two metal plates (machined in our shop by Jan) which hold the actual bite plates. 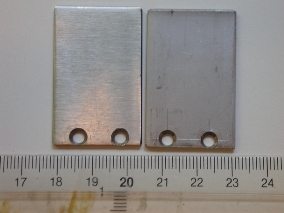 The bite plates are removeably attached to the top and bottom plate by a bolt. Thus plates of different size and thickness can be used for different animals. 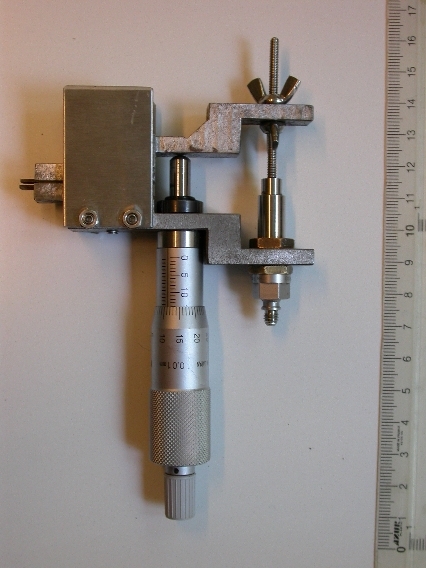 The other novelty in the current bite force meter is the use of a Mitutoyo micrometer head as a fulcrum. The advantage of the micrometer head is that the plates can be repeatedly and accurately set at any distance from one another. 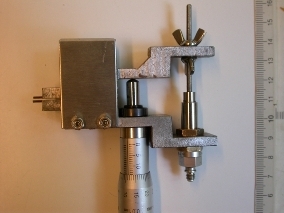 Additionally, the micrometer head is ball-tipped such that the fulcrum is effectively transformed into a point contact and absorbs none of the actual bite forces in friction. In front we have mounted metal guards on the lower plate that prevent the plates from sliding relative to one another, and keep the animals away from my fingers. Below I have provided some thumbnail pictures of the different parts of the setup. Click on any of these to get a larger picture. 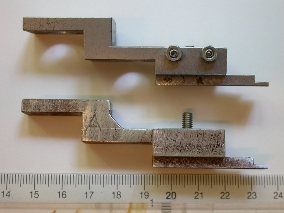 From left to right you have an overview of the set-up, a zoom of the bite plates in situ, a bottom view of the top plate, a top view of the bottom plate, a side view of top and bottom plates and a side view on the guides. Note that the ruler included in the view is in centimeters. The use of piezo electric sensors has been a real blessing as these come pre-calibrated, are robust, and largely temperature insensitive at the ranges we're measuring. Currently I use a Kistler 9203 sensor which can measure force (both tensile and compressive) up to 500 N. Sensors are attached to a handheld, portable charge amplifier, another relief after messing about with strain gauge based transducers and bridge amplifiers in the past. Technical specification sheets are provided below and are available on the Kistler and Mitutoyo websites as well (link below). The total cost of a field worthy set-up is about 3000 Euro but, i.m.h.o. well worth it.